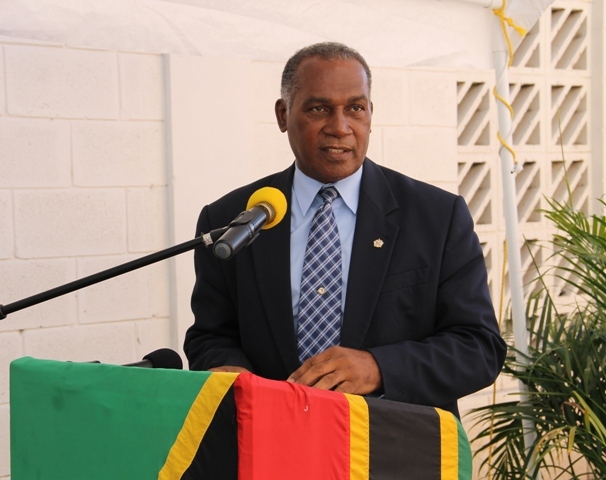 NIA CHARLESTOWN NEVIS (December 18, 2014) — Premier of Nevis Hon. Vance Amory lauded fire officers of the St. Kitts-Nevis Fire and Rescue Services Nevis Division for their ability to carry out their duties while they waited for the necessary equipment to carry out their duties on the island. 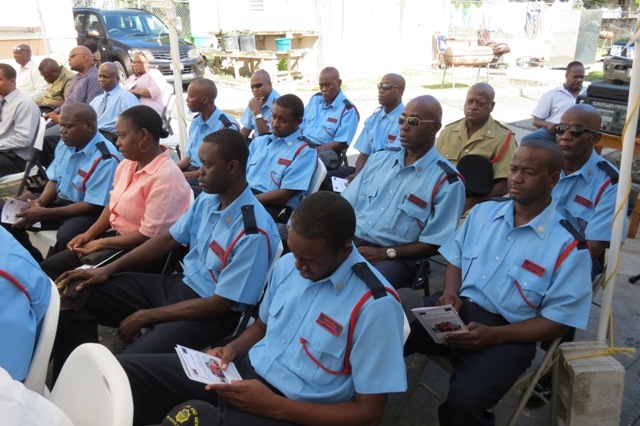 Mr. Amory’s commendation came when he made remarks at a handing over ceremony of a new fire tender on December 17, 2014 at the Charlestown Fire Station. The new equipment was funded by the 10th European Development Fund (EDF) and the Federal Government. “All of us would agree, that the Fire and Rescue Service Officers have laboured under very severe and trying circumstances.I have been present at some of the fire occurrences which we’ve had and seen the way in which they have had to really labour under those difficult circumstances to carry out their functions to save property and to prevent undue destruction of property. “I want to commend the fire officers because your work is in a way dangerous in some cases. It is difficult in many cases and I think, you have carried out your duties with the utmost regard for your profession and for the transaction of your responsibility to the people of your country. I want to recognise you for that,” he said. The Premier welcomed the new fire tender for use on Nevis and noted it would be of help to the officers. “We’ve had fires and we have people who are irresponsible and sometimes they do things and we have people make mistakes and so on but I do pray, that even as we are accepting this fire tender this morning to improve the level of the equipment which we have had in Nevis, that we will not see any undue use of that vehicle, of that equipment,” he said. Mr. Amory stated that the Nevis Disaster Management Department had been working closely with the Fire and Rescue Service Officers over the years and had told him of the lament and concerns they had over the years with when they had to be part of a response team to fires and other difficulties they faced. 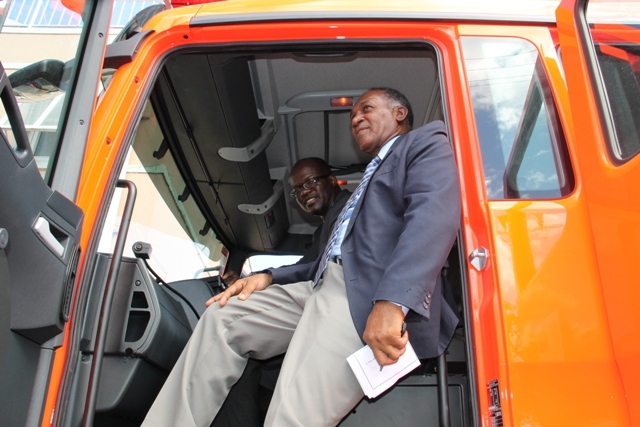 The Premier thanked those who made the new fire tender a reality on behalf of the people of Nevis. “I want to thank the former Fire Chief because he told me sometime last year, that this fire tender was being ordered and I know he was very keen on it coming and I want also to thank the Federal Government and the technical offices, the Prime Minister, the Minister of National Security and Homeland Security for pursuing this purpose to get this fire tender here for the use of the people of Nevis and to add also, my gratitude to the Governments of the European Union for providing the significant funds to acquire this fire tender,” he said. Mr. Amory, however, registered hope that other areas related to security on Nevis would also receive much-needed assistance. “There may even be challenges elsewhere but I know for a fact, that there are serious challenges where the Police Station at Newcastle is concerned and I trust that in the new year or at a convenient time, that there will be some funds made available to have that facility rebuilt, so that we can combine the total integrated service of security, providing the Police with their support as we are now providing the Fire and Rescue Services with their equipment,” he said.